Whatcha Doing? 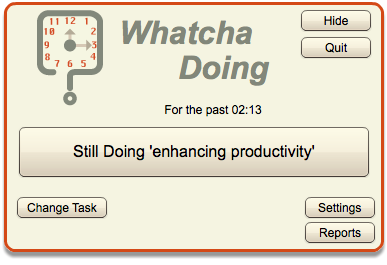 is a Free Time and Task Management tool that runs in the background and periodically prompts you to record your task activity with as little as one click, no need to constantly split attention to work and time tracking. No need to remember to start or stop clocks, or switch tasks in the middle, Whatcha Doing? takes handles it all for you. Printable reports can help analyze performance and identify opportunties! Recovering just one hour of lost time and Whatcha Doing? pays for itself! Note: EXISTING 1.01 LICENSED USERS, please email licensing@fish-bytes.com and request a free license upgrade key. Optional premium services extend the FREE single user version with group tracking and support for popular project management systems, including 37Signals' Basecamp!